Skylake is the codename for Intel’s latest processors that were launched in August 2015 as the successor to their Broadwell CPUs. Skylake is Intel’s sixth-generation CPUs and feature a number of improvements over Broadwell processors. Skylake CPUs, like the Core i7-6700K, were designed to work with 100-series chipsets, such as the Z170. Read on as we dissect our list of the best Skylake motherboards. In a hurry? For your convenience, here is a link to the top Z170 motherboards for Skylake CPUs on Amazon. Motherboards that support Skylake processors feature an LGA 1151 socket and introduce widespread support for DDR4 memory. The majority of socket 1151 motherboards have support solely for DDR4 memory while some support DDR4 and DDR3, however only one type of memory can be installed at one time. Socket 1151 motherboards contain Intel 100-series chipsets, with the first boards to be released featuring the Z170 chipset. Other chipsets to feature in these boards include the H170, Q170, and B150. Intel released two initial Skylake CPUs: the Core i7-6700K and the Core i5-6600K. Further Skylake processors were released towards the end of 2015, including the Core i5-6600, the Core i5-6500, and some new Pentium processors. Skylake chips are also compatible with motherboards that have the Z270 chipset. Learn more as we compare and review our top three motherboards that are a perfect pairing for your Skylake CPU. Each motherboard has a short review followed by a link to more reviews and prices. The Asus ROG Maximus VIII Formula is one of the more expensive Z170 motherboards. However the design, feature set, and build quality make this a motherboard that will stand the test of time. One thing that sets this board apart from others in its class is the ability to have it in any color you wish, meaning you will have no problem fitting it into your color scheme. Total color customization is possible thanks to the RGB LEDs that are strategically placed around the motherboard, like the shield and heat sinks. Another feature which helps to justify the price tag is a full VRM waterblock that has been designed in collaboration with EK Water Blocks. Unlike other integrated waterblocks that attach to the heatpipes, the CrossChill waterblock actually makes direct contact with the VRMs. Air or liquid can be used to cool, however, when you use liquid, you can decrease MOSFET temperatures by 23˚C. The reviews speak for themselves with a majority of online purchasers giving this product a perfect review. If you pair this with your Skylake based Core i7 6700K or Core i5 6600K, you will be in gaming heaven. Asus has also confirmed that this motherboard is compatible with Kaby Lake CPUs, making it a future-proof purchase that will remain a top motherboard choice for years to come. 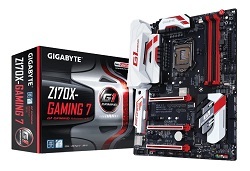 The abundance of features and options make the Gigabyte Z170 Gaming 7 motherboard a high-end beast that is a favorite amongst gamers and casual users alike. It is priced in the mid-to-high end of the scale, but if you are serious about gaming, you really need the best tools at your disposal. With Dual M.2 slots, three PCIe x16 slots, and three SATA Express slots, this board has almost endless connectivity options. When you throw in dual Gigabit Ethernet controllers (one being a Killer E2400), a Thunderbolt 3 connector with bandwidth up to 40Gb/s, and a Creative Sound Core3D Quad-Core Audio Processor, you start to see why the price is justified. With a majority of positive reviews from online customers, the Gigabyte Z170 Gaming 7 motherboard is a popular choice among Z170 boards. Add in the fact that it is compatible with Intel’s Kaby Lake line of processors, the Gaming 7 will likely remain a firm favorite for the foreseeable future. 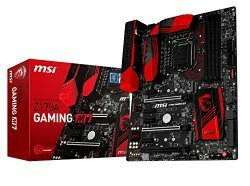 The MSI Z170 Gaming M7 is a motherboard that has been designed for gamers. From the eye-catching red and black aesthetics to an abundance of features, this board will pair up nicely with your Skylake based i7 6700K or even your i5 6600K. The Game BOOST dial is one of the stand-out features of this board. It is an upgrade to the overclock button that was featured on previous MSI boards, and it allows you to automatically overclock through eight stages. Just turn the dial to whatever stage you want and reset the PC and the overclock will apply. For those of you who prefer manual overclocking, this option is still available in the BIOS. Again, this is a very popular choice that has received a positive response from its users. Many of its users rave about the build quality of this MSI motherboard, and I have to agree. It feels heavy for a motherboard, and this is due to the fact that MSI seems to have reinforced it, which is a good thing when you consider that other boards can bend quite easily. You won’t be disappointed with this motherboard, and MSI has confirmed that it is compatible with Kaby Lake CPUs, adding more value and increasing its lifespan. If you own an Intel Skylake processor, then pairing it with a decent motherboard will complement and bring out the best in your Skylake computer set-up. The Skylake line of CPUs from Intel have dominated the computer market since their release as the sixth generation of Intel core micro-architecture processors. The Skylake chip has new improvements and features that will offer you faster clock speeds than ever before. It promises and delivers 4K support, up to 30% better battery life, improved graphics, and support for DDR4 RAM. Despite this, if you do not equip your Skylake PC with a top of the range LGA 1151 motherboard, it will fall short of performance and expectations. We all know motherboards tie the links to allow communication between electronic components of a computer system. It answers the fundamental question of what your PC can or cannot run. A motherboard that does not measure up to the quality of your computer processor will limit its optimization. Therefore, ensure that you optimally utilize these state of the art and expensive drives, overclocked CPUs, and graphics cards by supporting them with the best motherboards. Below, we will take you through the necessary features you should be on the lookout for when purchasing a motherboard to pair with your Skylake CPU. Since the motherboard of a PC is the body through which other parts of the PC fit in, it must be compatible with those other components. Intel’s Skylake CPUs demand specific features from their motherboards to ensure optimum performance, and motherboard manufacturers are starting to produce Skylake models. Here is a guide that explains all compatible features and specifications to help you understand what to look for when buying a Skylake motherboard. The 1151 motherboard line-up for Skylake CPUs were shipped with the following chipsets: Z170, H170, A170, B150, Q150, and H110. This is the first criterion you should consider when purchasing a motherboard for your Skylake processor. There are three standards for sizes of motherboards, and each of them has a different number of slots to insert cards, including tuner cards, graphics card wireless NICs, and display adapters. ATX is a desktop personal computer size motherboard. The micro-ATX is smaller than the ATX by two inches and offers less PCI slots than the ATX. Although, it still provides openings to install two graphics cards. Moreover, some micro ATX boards have as many features as its bigger ATX models. The mini ITX drops smaller in size than the micro ATX. It has one PCI-E slot. This means it can only accommodate one PCI-E SSD, graphics card, or any other type of expansion card. This option also limits your memory slots to two, and it will only give out 32GB of RAM. DDR4 memory is the standard for Skylake motherboards. It has a higher MT/s, a higher capacity of 16GB per stick, and is more energy efficient. Your Skylake computer will make broader use of the DDR4 memory. However, manufacturers are making good progress in tightening the timings of this memory. Some Skylake motherboards also support DDR3 memory, if DDR4 is out of your price range. DDR3 is cheaper, slower, and consumes more power. Skylake CPUs provide support for DDR3 and DDR4 sockets to aid conversion. Nevertheless, you cannot run both types of memory at a time. There are many connectors and slots on motherboards, and these are worth paying close attention to if you intend to get the correct Skylake motherboard for your needs. The PCI slots, which dominate the middle of the motherboard, accommodate the networking cards, sound cards, SSDs, and graphics cards. PCI slots are of many types, which include PCI, PCI-Express x1, PCI-Express x4, PCI-Express x8, and PCI-Express x16. PCI-Express x16 with 16 pathways offers the highest bandwidth, and it is the longest. The high bandwidth makes it suitable for graphics cards. PCI-Express x4 usages are common in RAID cards and SSDs. PCI-Express x1 are popularly used for wireless NICs and expansion cards such as SSDs and sound cards due to their smaller size. High-End Skylake motherboards will have three or four PCI-Express x16 slots and several other PCI slots. There are plenty of sockets and ports on most motherboards to satisfy users, but you should be attentive to the type of CPU you have. If you have a CPU that requires sufficient cooling, or if you plan to overclock, then make sure your motherboard has many fan connectors. In addition, not all boards will handle hard disks in large numbers or run multiple graphics cards. The best Z170 motherboards will have any of the following three storage connectors: standard SATA connector, SATA express, or M.2. The standard SATA connector provides a large bandwidth to satiate SSDs and standard hard disks. SATA Express, which is an improvement on standard SATA, offer faster speed through PCI lanes. These two types are limited in function due to compatibility issues. You should find one or two of them on motherboards. The M.2 connector, which takes a resemblance to a stick of RAM and fits flat on a motherboard, is the most general formats for SSDs of the next generation. The drives on use here run at faster speeds compared to SATA based SSDs because they use PCI lanes, too. Decent motherboards will have one or two of these. If you are a gamer or love tweaking, you should consider some on-board features, such as reset and power buttons, BIOS, LED POST displays, and robust voltage regulator modules. The on-board reset and power buttons come in handy for a quicker reset if overclock does not work. The voltage regulator modules will help to handle additional power draw. The LED POST display shows codes that help with troubleshooting problems. Higher-end boards are more tempting in their features for a serious overclocker. While Intel has provided Skylake CPUs, the duty is on you, as a user, to equip this processor with a motherboard it deserves. In all, purchasing a Z170 motherboard should pose no problem for you if you take the above features and specifications into consideration.